Well, I wouldn’t mind this in my own backyard. 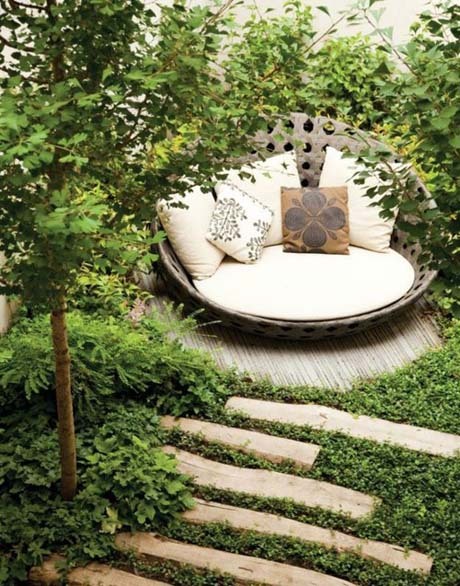 A whopping big comfy chair surrounded by lush green ground cover. Shown here is a “cascade of terraces” at a New York city apartment. Which goes to show, even city-dwellers can enjoy the outdoor life. The blurb for this award-winning design says: “A view of the first floor garden reading nook from the upper terraces reveals a texturally rich and diverse material palette.” Lovely. Hi Jane, did you help write the NZ Gardener DIY garden design? Im trying to find out what a flower is on the front cover , one with lanky purple stalks and flat white clusters of flowers on top? Also some similar on pg 12 with yellow tops, next to some cool spiky purple flowers. Sadly they don’t list the plants next to the pictures! No, I didn’t help write that sorry. But I just did a quick google to view the cover. The white flower with the purple stalks looks very much like Anthriscus sylvestris ‘Ravenswing’. Sorry, I can’t see what’s on page 12, as I don’t have the magazine in front of me. I will try to find a copy and let you know.